One photograph of the Dim in the Sun Portrait series. A self-portrait diptych shot on Oct.6 when I was experiencing unstable mood. At the moment when comfort was much needed, one of my close friends said to me "I'm afraid you have such bad mood disorder or borderline personality disorder," which made me upset. Jinglin Ji does ballet in Fetzer Gym dance studio on Sep.23, 2016. 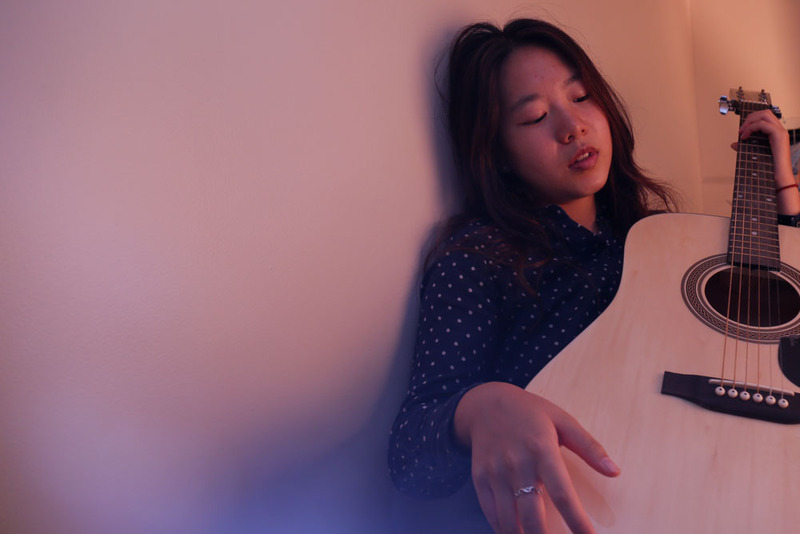 Jiayi Liu holds her guitar in her dorm bed at UNC on Sep.29, 2016. Jinglin Ji poses in front of the mirror in the dance studio in Fetzer Gym on Sep. 28, 2016. Jinglin Ji holds a flash pen while doing the ballet movement. Xiaoyin chen poses in water in a bath tab on Oct.25,2016. Xiaoyin Chen poses for a portrait shoot in the bathroom tab. I took my MEJO584 classmates' portraits during our trip to Puerto Rico March 9 to March 17, 2018. These portraits were specifically taken in Old San Juan.